I was spending time with a little girl, and she was doing great during the time we were together. I started to ask her to define some words, and she was correctly replying. I asked her, “What is a house?” She said, “Oh a house…someday I hope I will have a house.” Trying to keep conversation going, I said, “Oh do you live in an apartment?” She replied, “No, I’ve never had a home.” I just looked at her…and she expressed, “We have always lived in shelters.” She went on to explain to me the different shelters in town and the details about each one of them. She said there are rules and you can only stay for so long before moving on to the next shelter. There was something special about this little girl. I told her that she could have her very own home someday. I told her that she needed to keep working hard in school, and never give up on her dreams! I quickly thought of the scripture where Jesus explained to the disciples about the Father’s house and how He has prepared a room for them. I spoke with her family and we discussed her development and that she is doing really well. Her family needed a few resources, and a local church that Building All Children has partnered with provided for the family. That evening I came home and couldn’t stop thinking about this little girl and her life. I do believe in her…and I believe good things will come from her life and her story! Needless to say, she stole my heart, but she also helped me look at my life differently. When my children were little, I read The Power of a Positive Mom by Karol Ladd (it was my go-to book). Every mom needs to read it! I wanted to share a poem from this book…. Thankfulness…is what I learned! I will pray for this little girl! 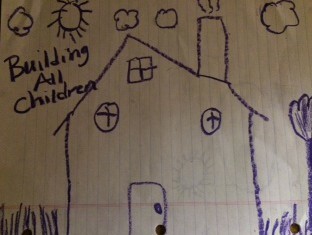 Pray that she can get out of the cycle of poverty and some day have her very own house!